Peanuts are not actually nuts; they’re legumes, like peas and beans. One acre of peanuts will provide 30,000 peanut butter sandwiches! Two American Presidents were peanut farmers: Thomas Jefferson and Jimmy Carter. This is the reason that the month of November was chosen for The Great American Peanut Butter Festival! In honor of this fun celebration, I’d like to share a recipe with you which I made for my handsome sons last night. They’re great! Justin ate two squares with a glass of milk for breakfast this morning and was totally full. I found it on MarthaStewart.com. I love Martha’s Website! Whisk together salt, baking powder, and flour. Add to bowl of mixer on low speed; combine. Add vanilla. Transfer two-thirds of mixture to prepared pan; spread evenly with offset spatula. (this will be very thick and stiff, like peanut butter cookie dough.) 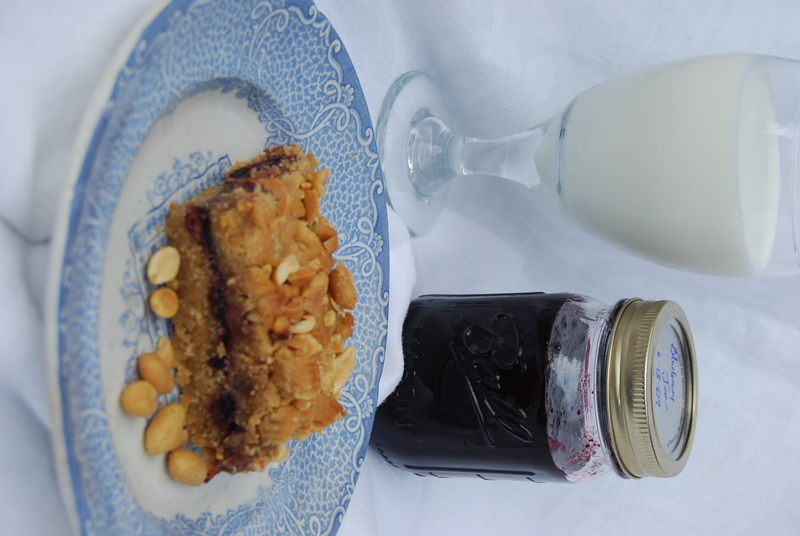 Using offset spatula, spread jam on top of peanut-butter mixture. Dollop remaining third of peanut-butter mixture on top of jam. Sprinkle with peanuts. These bars are thick and chewy and moist. 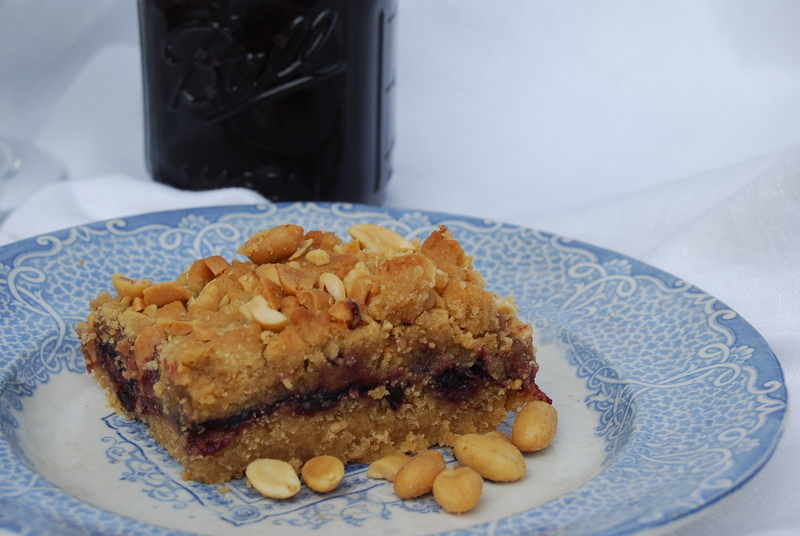 The layer of sweet blueberry jam was the perfect pairing with the creamy, salty peanut butter. Justin suggested using chocolate chips for “peanut butter cup bars” next time, instead of jelly or jam. That might be good! Let me know if you try it. I’d love to hear your variations! Now, on Friday I’ll share the recipe that I’ll make on “Cooking Up a Storm” with Grant Dade on KLTV7 in Tyler. If you’re up at 6:20a.m., make sure to watch! It’ll also be posted on their website during the day on Friday. I have been blessed by all your support and encouragement about this; I have loved the messages you’ve sent me! You guys are so nice! Thanks! Next Post Cooking Up a Storm For the Great American PB Festival: Cookies! This is great since I don’t need to grab a pot holder or towel to open the lid. I highly recommend the Crock-Pot Cook Carry Countdown Slow Cooker as a great slow cooker that any household would be grateful to have. Consumer Product Safety Commission (CPSC) is still interested in receiving incident or injury reports that are either directly related to this product recall or involve a different hazard with the same product.